Einojuhani Rautavaara turned 80 years on October 9, 2008. To coincide with this anniversary, Ondine has released a new recording of Rautavaara's complete works for male choir, featuring the YL Male Voice Choir and the Talla Vocal Ensemble (ODE 1125-2D). Spring 2009 will see the release of the complete eight symphonies in a limited edition box (ODE 1145-2Q). The iconic Finnish composer's birthday was celebrated in Helsinki, in the presence of the international press, with Finnish premières of Lost Landscapes at the Sibelius Academy in Helsinki (7 October) and A Tapestry of Life by the Helsinki Philharmonic Orchestra under the direction of Olli Mustonen (8 & 9 October), in addition to a performance of Book of Visions by the Finnish National Opera Orchestra conducted by Mikko Franck (30 October). To see a video documentation of the birthday celebration events in Helsinki, produced by the French online magazine ClassiqueNews.com and including interviews with Einojuhani Rautavaara and Reijo Kiilunen, click here. 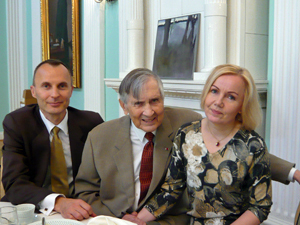 Photo: Reijo Kiilunen (left) with Einojuhani and Sini Rautavaara at the official luncheon, hosted by the City of Helsinki to celebrate Einojuhani Rautavaara's 80th birthday, at the Old Town Hall on October 9, 2008.